I am using SharePoint 2016 online I believe is what it would be. 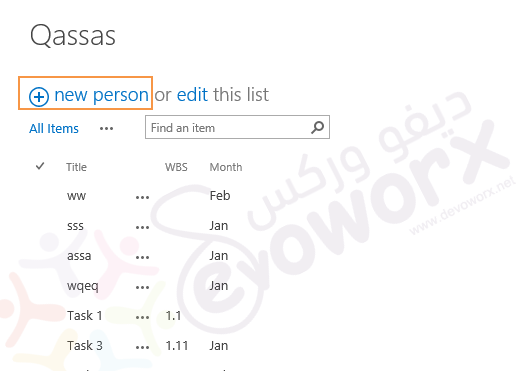 I have SharePoint designer 2013 to customize my page. Open your Custom List via Browser. This code does not require jQuery and it assumes that there is only one "New Item"-button on the page. Furthermore, this script will also change the "New Item"-text gain after you went into Quick Edit mode and back. Just note that for PowerApps, if you create a PowerApps form, this "trick" will fail. The aspx page (NewForm) is labeled the same but the classic view vs the newer view (the one that hosts the PowerApps form) does not have this script option on that view page. I'm assuming the work around for this would be to add the WebPart in the template/masterpage. Frustrating as you end up with two forms (one that you don't want because it shows all your columns - not always a desire), and the UX is dependent on the type of SharePoint view the user chooses, which you've no control over - one will say "New Item" (the one with the PowerApps form), the other will say "New Person" (assuming you added the script) on the view that has the "old fashion" view. Maybe MS could just add a variable for "New Item" and make it something we can assign values to??? As they say, "down with idiot values". HTH.